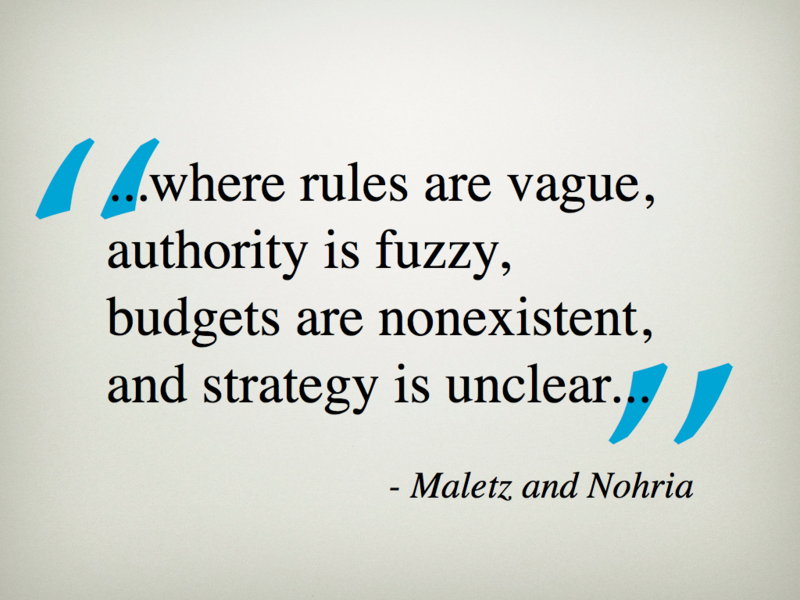 Whitespace in business is defined as a place, “…where rules are vague, authority is fuzzy, budgets are nonexistent, and strategy is unclear…” It’s the space between the organizational chart, where the real innovation happens. It’s also a great definition for what we see in Africa, and it’s the reason why it’s one of the most exciting places to be a technology entrepreneur today. I just finished with a talk at PopTech on Saturday where I talked about “The Idea of Africa” and how Western abstractions of the continent are often mired in the past. It’s not just safaris and athletes, poverty and corruption – it’s more nuanced than that. Today I’m in London for Nokia World 2011 and am speaking on a panel about “The next billion” and how it might/might not turn the world upside down. 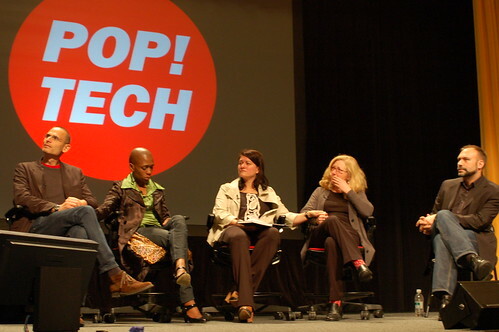 In my comments tomorrow, I’ll probably be echoing many of the same thoughts that came out over the weekend at PopTech. I talk a lot about this with my friend Ken Banks, where we look to scale our own products (Ushahidi and FrontlineSMS) in a less traditional format. As entrepreneurs you’re driven to scale, but our definition of scale in the West tends to be monolithic. Creating verticals that are incredibly efficient, but which decreases resilience. In places like Africa, we have this idea of horizontal scaling, where the product or service is grown in smaller units, but spread over multiple populations and communities. Where a smaller size has its own benefits. In this time of corporate and government cuts, where seemingly oversized companies are propped up in order to not fail, there are some lessons here for the West. We shouldn’t be surprised that the solutions to the West’s problems will increasingly come from places like Africa. Instead of thinking of Africa as a place that needs to be more like the West, we’re now looking at Africa and realizing the West need to be more like Africa. Will we increasingly see a new set of innovative ideas, products and services coming from places like Africa and spreading to the rest of the world? Why is Africa such a fertile ground for a different type of innovation, a more practical one – or is it? Disruptive ideas happen at the edge. Africa is on the edge. While the world talks at great length about the shifting of power from the West (US/Europe) to the East (India/China), Africa is overlooked. That works in our favor (sometimes). A couple of the ideas and products that have started in Africa and been exported beyond the continent include; Mpesa, Ushahidi and Mxit. 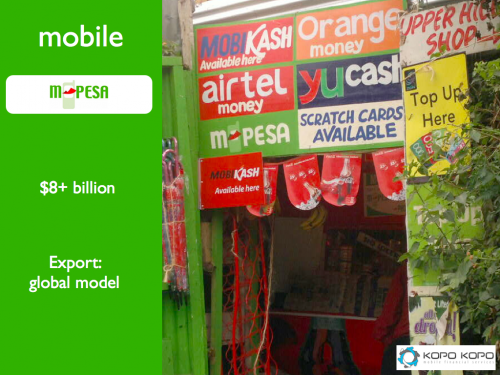 Mpesa – the idea came from Vodafone, but product met it’s success in Kenya. Over $8 billion has been transferred through it’s peer-to-peer payment system. Vodafone has failed to make the brand go global, but the model itself is being dissected and mimicked the world over. Ushahidi – we started small, from Kenya again, and driven by our Crowdmap platform now have over 20,000 deployments of our software around the world. It’s in 132 countries, and the biggest uses of it are in places like Japan, Russia, Mexico and the US. 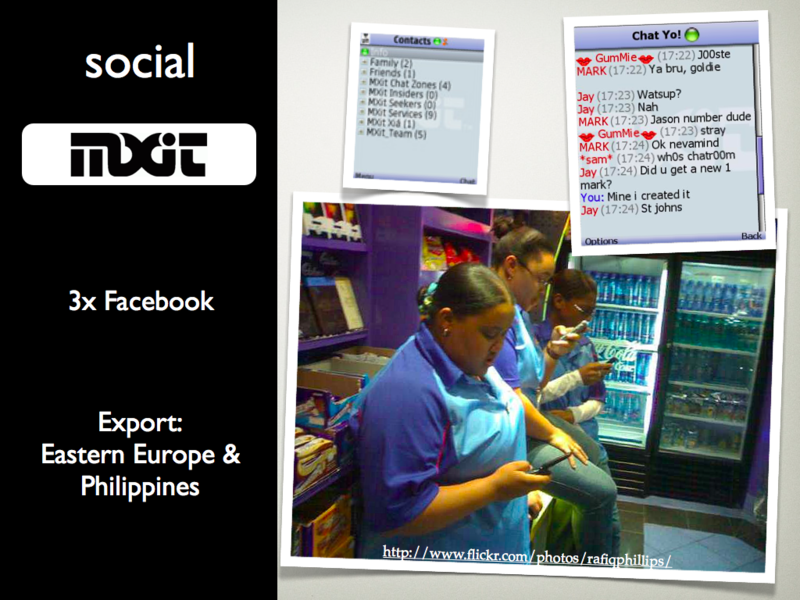 Mxit – the famous mobile chat software from South Africa has 3x the number of Facebook users in that country, and has over 25 million users globally. Like we see at Maker Faire Africa, these innovative solutions are based on needs locally, many of them due to budgetary constraints. 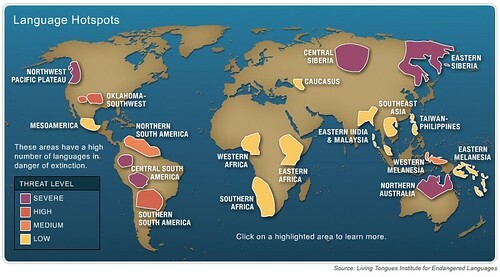 Some of them due to cultural idiosyncrasies. Often times, people from the West can’t imagine, nor create, the solutions needed in emerging markets, they don’t have the context and the “mobile first” paradigm isn’t understood. A good example of this is Okoa Jihazi, a way to get a small loan of credit for your mobile phone minutes when you’re out of cash to buy them, from the operator. They’ve built some safeguards in to protect against abuse, such as you have to have had the SIM for 6 months in order to get the service. It works though, because the company selling it (and many of the mobile operators do across Africa) understands the nuanced life of Africa. We hold on to technology longer, experiment on it, abuse it even. SMS and USSD are great examples of this, while much of the Western world is jumping on the next big technology bandwagon, there are really crazy things coming out in emerging markets, like USSD internet, payment systems, ticketing and more. Throughout the world, the basic foundation of any technology success is based on finding a problem, a need, and solving it. This is what we’re doing in Africa. We have different use cases and cultures, which means that there will be many solutions. Some will only be valuable for local needs and won’t scale beyond the country or region. Others will go global. Both solutions are “right”, it’s not a failure to have a product that profitably serves 100,000 people instead of 100 million. Turning the world upside down has as much to do with accepting this idea of localized success as an acceptable answer as it does with explosive global growth and massive vertical scale. 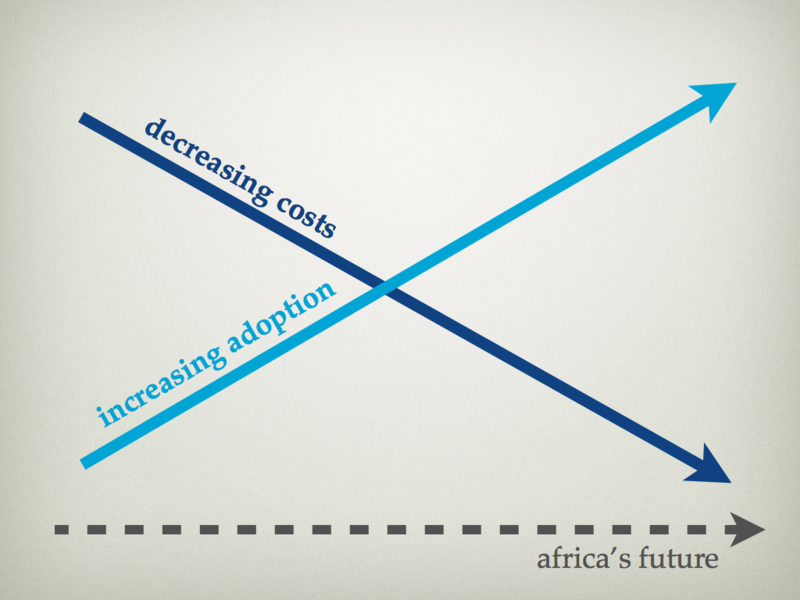 Trend #1: Adoption by Africans as consumers is increasing. 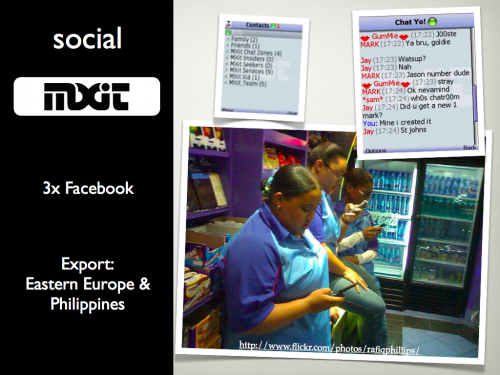 Let’s get back to my talk for tomorrow at Nokia… 87% of sub-$100 phones sold by Nokia are sold in emerging markets. 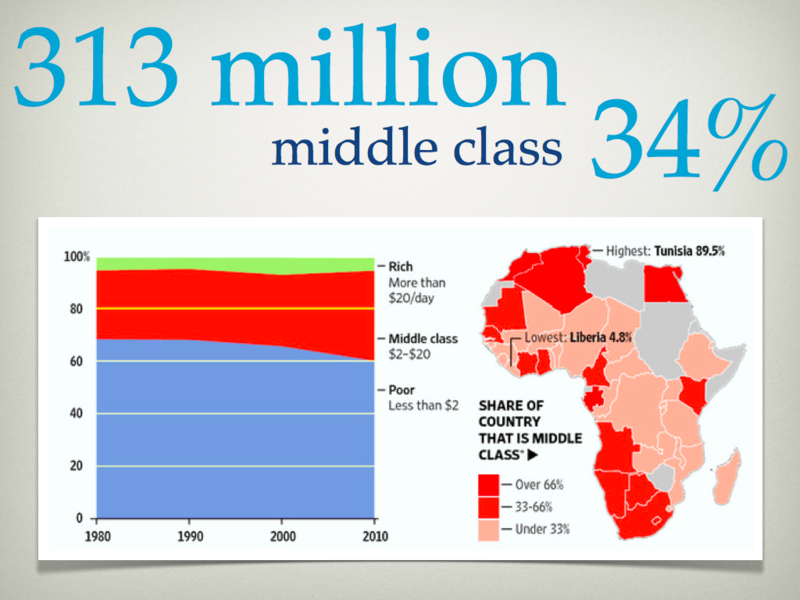 34% of Africa’s population (313 million) are now considered middle class. 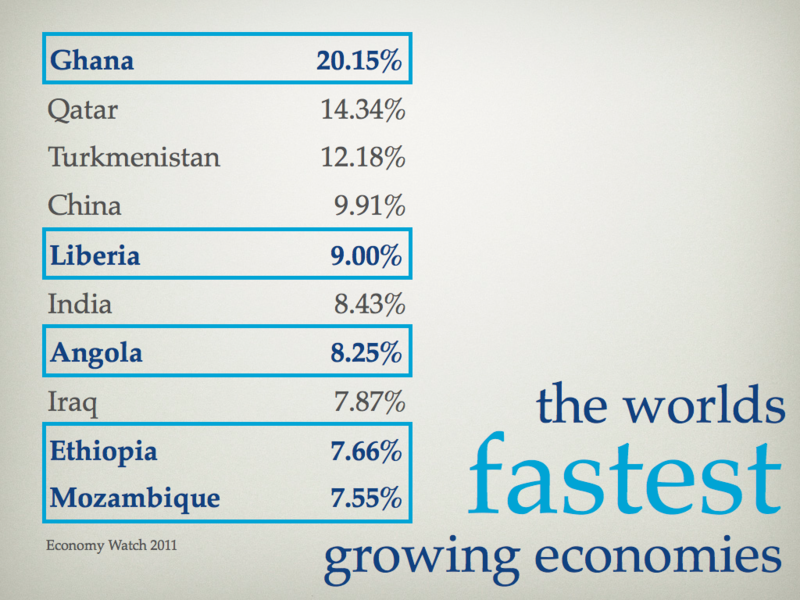 The fastest growing economy in the world is Ghana, 5 of the top 10 are African countries (including Liberia, Ethiopia, Angola and Mozambique). Across the continent, the average GDP growth is expected to be at 5+% going forward. At the same time, we’re seeing bandwidth increase, and bandwidth costs decrease. Mobile operators are the continents major ISPs, and they’re getting creative on their data plans. Handset costs are going down. Smart(er) phones are available for less than ever before. We even have one of the lease expensive Android phones in the world at $80 in Kenya, the IDEOS by Huawei. Is it all bright and rosy? Not at all. 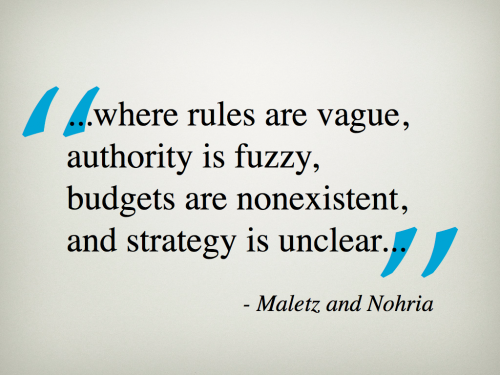 You’re on the edge, you have to create new markets, not just new businesses. But in that challenge lies opportunity, for it’s from these hard, rough and disruptive spaces that great wealth is grown. If you’re an African entrepreneur, why would you want to be anywhere else? With hundreds of applicants from 58 countries, you have to be good to get here. As always, this year of Fellows is impressive and each one has already done something incredible to make it to this stage. We’ve got clean energy entrepreneurs, mini-manufacturing technologists, big data crunchers, girls health innovators and music community engineers. It’s a mess of engaging, driven individuals that remind you why the odd ones in the crowd are the ones that give us hope. For the Fellows in the program, this is a chance to learn from some of the foremost experts in the field of communication, design, branding, negotiation, strategy and fundraising. 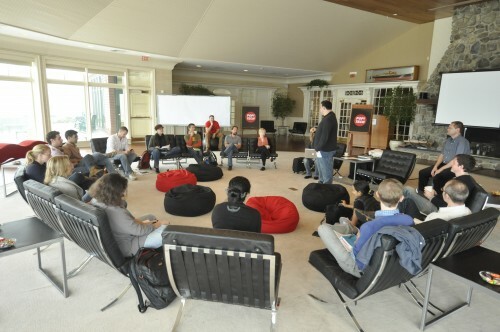 The Fellows each get a chance to do a 5-minute talk on the PopTech main stage. Finally, the network that everyone is injected into gives them an amazing opportunity to connect and meet people that can help them realize their projects goals. 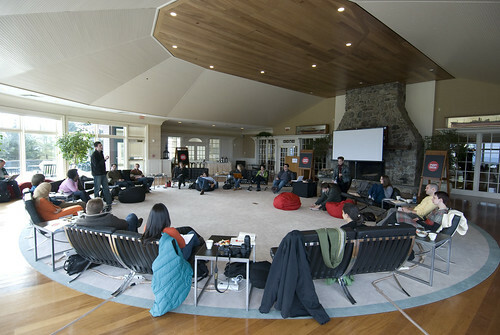 PopTech does something very interesting, the conference is the big “annual gathering” of the network. 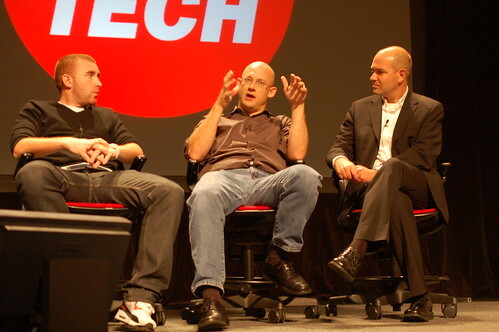 It’s full of great talks, as you’d expect, but you’d be wrong if you thought that was the reason PopTech exists. 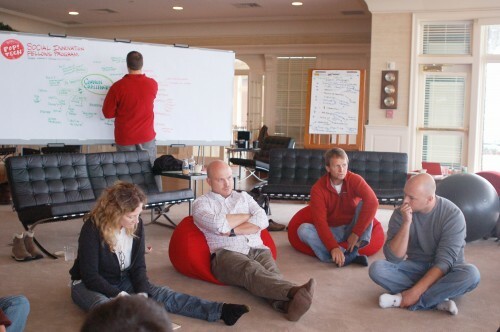 The organization itself is a catalyst, focused on accelerating ideas that can change the world. The increased focus of the PopTech leadership on the Social Innovation Fellows, the Science and Policy Fellows and the Accelerator Labs that are put on in cities around the world are proof that their goal is to take all of the energy and resources that a focal point like a conference of their stature brings together, but to then direct that energy like a laser into the people and projects that they think can make a massive impact on the world. 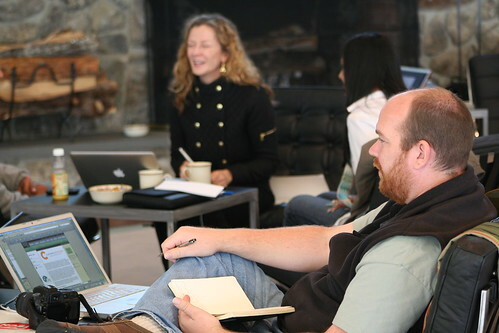 The Fellows program fits into the PopTech organizations focus on finding people creating Innovative tools that impact positive societal change and then bringing them together with communities of stakeholders and other practitioners. This is the third year that I’ve gone to Pop!Tech. I’m part of their Fellows program this year, along with Ken Banks of FrontlineSMS, as a faculty/Senior fellow member helping with the event for the incoming 2010 class. As usual it’s a surprising number of interesting and intelligent people that are in the midst of changing the world. One of my favorite things about the program is how we’re shuttled off to a beautiful setting in the Maine woods to spend time with experts from a number of different fields. It’s a time for contemplation on the reasons that you do what you do, as well a chance to gain access to experts who will help you build and evolve your organization to fit your vision. This year, I know a number of the Fellows, making it feel like this is also a meeting of old friends. Matt Berg, a technologist with a focus on Africa, is here from Rural Technology Lab and ChildCount. Nina Dudnik, with Seeding Labs project getting scientific equipment and labs setup all over the world. Leila Janah, creating outsourcing work to rural Africa through Samasource. Funnily enough, I had to come all the way to Camden, Maine in the US to hear about an innovation in Kenya. One of the Fellows is Rose Goslinga, the founder of Kilimo Salama (meaning “safe agriculture” in Swahili). She has created an innovative micro-insurance program designed for Kenyan farmers. The project is a partnership between Syngenta Foundation for Sustainable Agriculture, UAP Insurance, and telecoms operator Safaricom. The service has been so wildly successful that Rose is missing the Fellows program due, she’s still in Kenya in the midst of scaling the service nationally. There are a lot of reasons to come to Pop!Tech, the conference, but honestly the highlight of my Fall is the Pop!Tech Fellows program that precedes it. It’s one of those seamlessly executed events where every detail is taken care of, which is a tribute to those orchestrating it, that pulls together some of the most amazing minds in the social innovator space into one place for a 5 days of immersion. 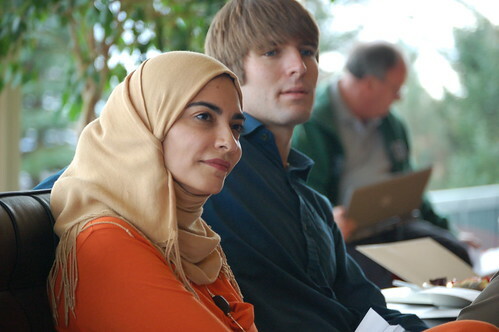 The faculty is world-class and the innovation Fellows are exceptional in so many ways, not least among them their areas of focus. This year I’ve met a young man figuring out ways to turn waste products into charcoal soil additives that increase crop yield by up to 200%. I thought I knew a little about the mobile space in Africa – and I did know a little, very little, especially compared to what Nigel Waller knows… Oh, and I sat amazed as a lady from Saudi Arabia shares how she won both the MIT and Harvard prizes for innovative business ideas (as a non-profit!) in one year – which is unheard of. The first thing you need to understand about this pre-conference Fellows event is that it takes place in an incredible location. It’s Fall in the woods of Maine, where we’re housed in cabins surrounded by trees of varying shades of yellow, orange and red. The bay sits below us, with wooded hills behind the idyllic and well-appointed retreat center. It’s the perfect setting to leave behind your daily life and embrace a few days of learning, discussion, renewal and growth. I was fortunate enough to be part of last year’s inaugural Fellows class, where fast-friends were made that still stay in contact. This year, I’m here as one of the two returning Fellows from 2008, with my partner Abby Falik, to serve as a bridge between the classes and help maintain a consistent ethos and to lend a helping hand wherever necessary. Beyond the photos, beyond the scenery, beyond the relaxing wood cabins – this event is about feeding my brain. It’s about the chance to meet and share a unique experience with my peers and learn from some of the world-class faculty. It’s about challenging ourselves and not just talking about the successes and “good stuff”, but about ways we can all be better and speak openly of our failures. This is a courtesy post so that you know most of my blogging this week is taking place at AfriGadget due to being one of the organizers for Maker Faire Africa coming up this weekend. I’m also doing some work on the “FLAP Bag Project“, testing out modular, solar and light-equipped bags in Ghana, Kenya and Uganda with Timbuk2, Portable Light and Pop!Tech. We’ve got a big release of Ushahidi coming up this week too, so keep an eye on the Ushahidi blog where I have another write-up coming. Here is my 5-minute talk that I did at Pop!Tech this Saturday. 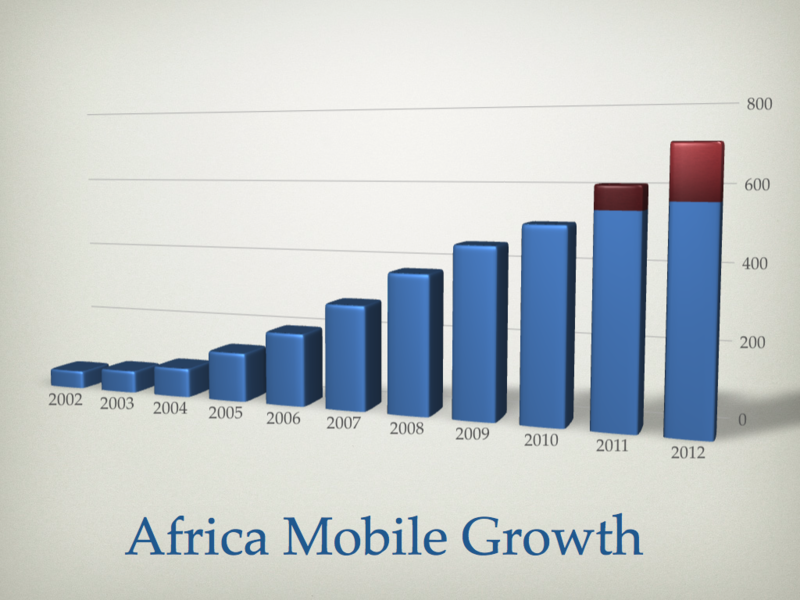 It touches on Ushahidi, AfriGadget and why I’m optimistic about Africa. The best part for me is that in a recording I can make sure I don’t forget any lines and I can add more images into the slideshow. I know I had to cut out a section of the talk in the live event as I was running out of time. Either way, I hope you enjoy it, as it’s a mixture of my history that explains a little of my present occupation. Ken Banks, who I’ve become even better friends with since we roomed together for the PopTech Fellows program, spoke today about FrontlineSMS. 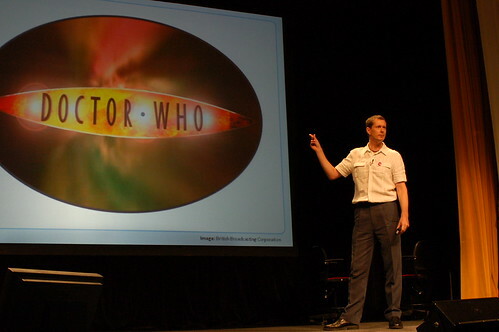 With his British accent, talk of Daleks from Dr. Who, and witty comments he won over the room. 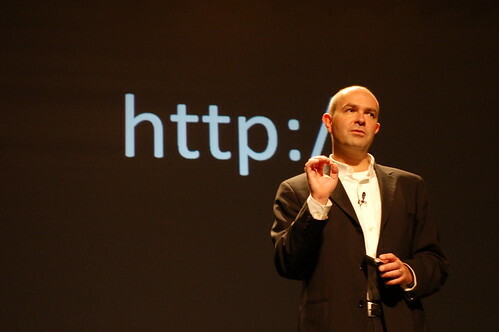 Two of my favorite speakers were in the first session of the day, Clay Shirky (Here Comes Everybody) and Chris Anderson (The Long Tail). Just read their books, it’s probably the best advice I can give you. When the team who worked on this went through the numbers, the impact and the process created to attack the issue of HIV in South Africa, it was incredibly emotional. 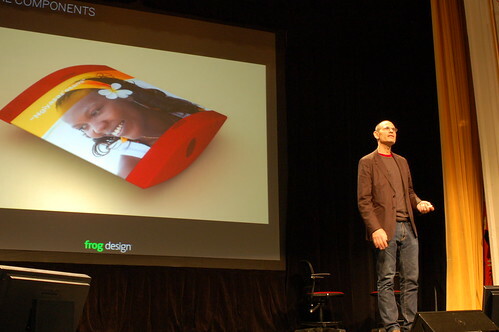 Robert Fabricant of Frog Design worked on this, and I’ve learned first-hand how this man can laser in on strategic design challenges – and they did the same for this project. Really, this was an all-star team, Gustav Praekelt – one of the most knowledgeable mobile phone specialists in Africa – is helping to run the program. It’s done using the 120 character free space in â€œPlease Call Meâ€ SMS system thatâ€™s used in South Africa. They tack on messages to get people to come to get HIV treatment in private, so that they don’t have to worry about what stigma attached to that treatment. If the rest of PopTech is anything like the morning of the first day, then I’m not sure my head can handle it. You can follow along live at Poptech.org/live, and track images on Flickr at PopTech08. Finally, follow the PopTech blog, as they liveblog the whole event. Here are my highlights and images from this event so far. Before I get started on today though, I need to give a quick shout out to Gever Tulley, who helped re-awaken my love of tinkering and creating with my hands. 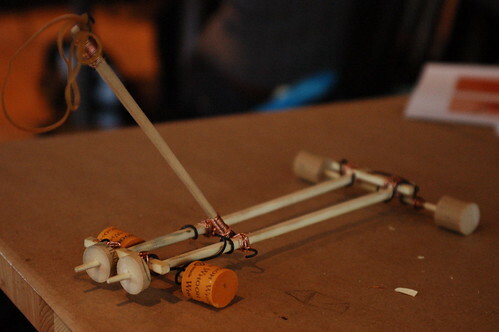 I spent yesterday afternoon bending wire, strapping down chopsticks and creating power with rubber bands. My masterpiece was a catapult-driven car. Best of all, Gever runs the Tinkering School, and he’s a big AfriGadget fan. Saul Griffith started us off with some amazing visuals supporting his studies into energy use by himself over one year. You can join in at his crowdsourcing project of personal energy use at a site called Wattzon. It’s really quite interesting to see the breakdown of energy use by those of us who travel a lot. 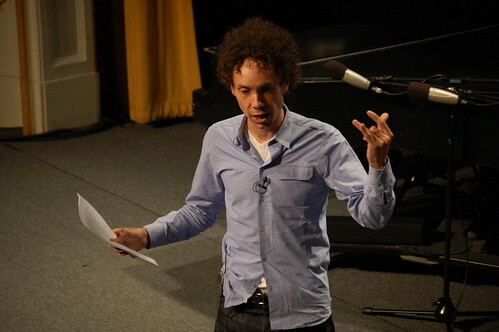 Malcolm Gladwell spoke about capital usage by societies – I’ve read both Blink and The Tipping Point, so am also going to buy his new book Outliers when it comes out. Frankly, he’s an amazing speaker and it was just enjoyable listening to him talk. Funnily enough, I got to chat with his mother during the break, which was unexpected. David Harrison is on a mission to save disappearing languages from all over the globe. He’s a professor of linguistics at Swarthmore University, and expressed well the need to save languages as we lose so much human knowledge that cannot simply be translated into a “global language”. Harrison has developed the idea of â€œlanguage hotspotsâ€ – examining where the highest diversity of languages are, where the danger is most and where knowledge that is not widely known exists. 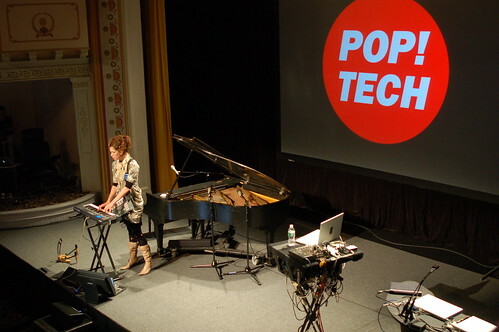 I actually didn’t know anything about Imogen Heap before I heard her here at PopTech. It was an absolutely fascinating moment for me, as she used technology to start echoing her voice and did a full song with only her voice weaving in and out in a symphony that can only be heard, not explained. Amazing. You can also follow her on Twitter @imogenheap. It was wonderful to finally meet Rob Katz, who started NextBillion.net – the website that tracks and keeps discussions alive around products and services targeted at the “bottom billion” people in the world. We have big plans of having a good long talk over the next couple days, more after that. 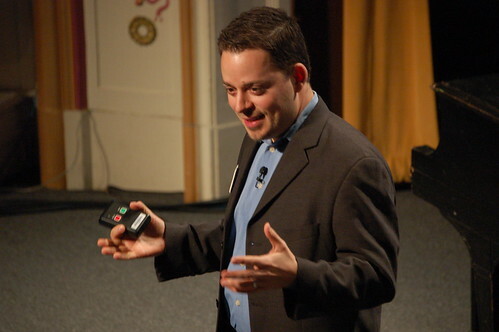 Lastly, a new friend of mine that is also a part of this year’s PopTech 2008 Fellows class, is Eric Dawson. One of the more grounded individuals that I’ve ever met, he exudes peace. This is good, as he runs an organization called Peace Games, focused on ending youth violence. His short talk was well done, asking us to not feed the evil, but the good in ourselves. 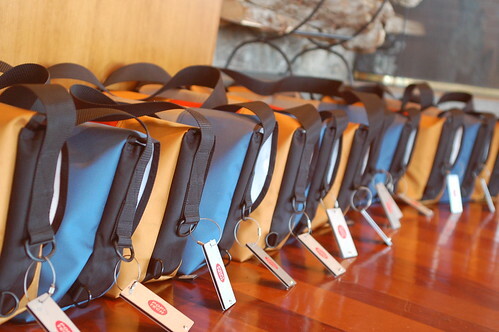 Best of all, the bags handed out by PopTech are by Timbuk2, and are excellent bags. However, anyone who wants to can donate their bag to Eric’s Peace Games organization for one of the 40,000 youth taking part in their program. Cheryl Heller, from Heller Communication Design, is spending the morning with us at the Pop!Tech Fellows program. We’re getting a crash course in branding and, “creating a brand promise”. Branding is more than a pretty logo or a nice website, it’s everything that you say, do or are perceived as. It’s what makes up the organization and it’s what people understand of you. I try to pay attention to the Ushahidi brand, but I got a rude awakening as Cheryl asked us to each stand up and give an elevator pitch on our organization. Embarrassingly, I had to stand up and stutter through some half-baked pitch on Ushahidi. Needless to say, I’m already working hard at getting this whole brand a lot tighter – all the more important as we have a growing community that needs to easily speak about the brand as well. 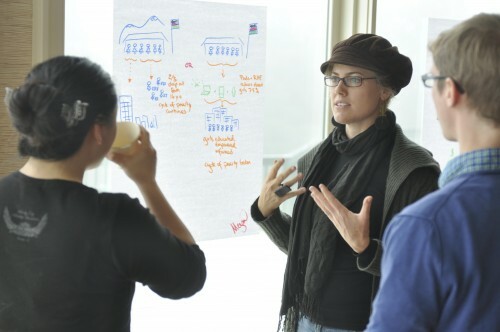 I was paired with Heather Fleming, of Catapult Design, to help each other figure out our brand promise. Cheryl came by to help us boil down some of these thoughts and channel them towards what it should really be. In a crisis or disaster, ordinary people have deeper insight into what’s going on around them than either the government or the news media. When you gather that information in aggregate, you start to see the bigger picture much more clearly. Ushahidi is a platform that allows you to crowdsource crisis information by SMS, email and the web. We believe that gathering that information is key to saving lives and speeding recovery during an emergency. It’s free and open source software, which means that anyone, anywhere in the world can use this platform. 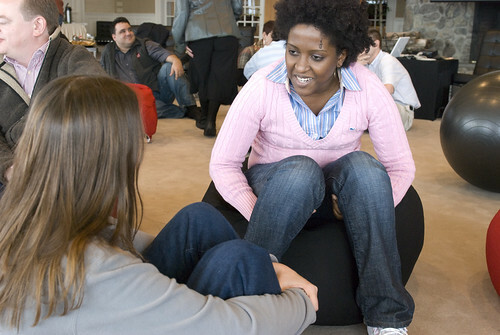 An invaluable exercise is to really learn to listen to others talk about your organization and brand. Hearing Heather and Cheryl talk about what their perceptions of Ushahidi is was more valuable that me endlessly talking about what I think it is. 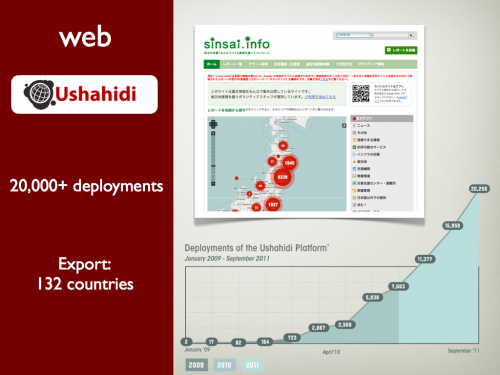 What is Ushahidi to you? How do you see it, and what’s the promise that you hear/see in us? 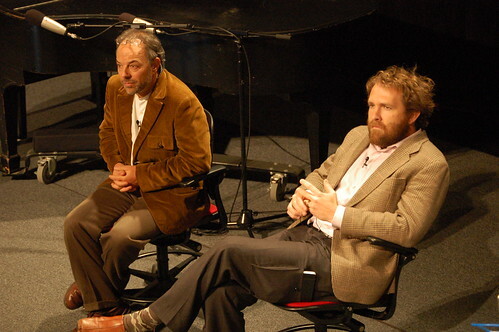 WhiteAfrican and Kiwanja at PopTech 2008, originally uploaded by whiteafrican. Having a tourist picture moment with Ken Banks of Kiwanja in Camden, Maine right before the Pop!Tech conference begins next week. We’re both Pop!Tech Fellows this year, which is turning out to be way more fun than we ever imagined. This reflection is in the door to the Camden Opera House, where the event will take place next week. 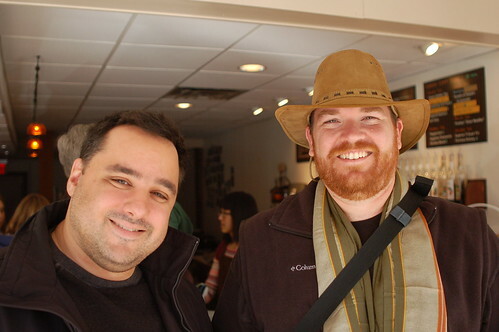 Here I am hanging out with Andrew Zolli, the curator of Pop!Tech, at the Zoot coffee shop. 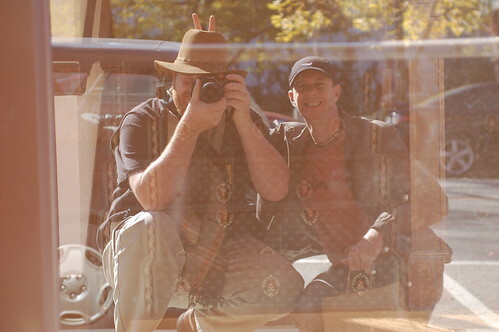 We spent way to much time talking camera lenses and then running around the area taking pictures. Fun times!